From Menai Bridge it is only a short journey down the old A5 to Llanfairpwllgwyngyll. The large memorial is on the left just before the turning into the car park for the famous station. Thirty-three men gave their lives during the 1st World War, and twelve during the 2nd. Their rank, name, address, unit, where they died and their age are all shown on this inclusive memorial. 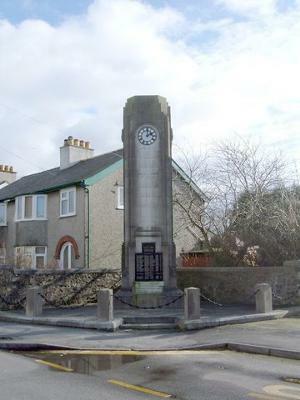 The memorial states that it was erected as a sign of love and devotion of the brave men of the parish who gave their lives for the country and the King on land and sea. and thought about your mothers. as they ride around North Wales. on the list of things to see.